Move along, Mars Bar. Step aside, saveloy. Here are the top five new deep fried foods you can find sizzling across the streets of London. Crispy Candy takes its deep fat frying technique so seriously it has a patent pending. Famous for their buttermilk-fried Oreo doughnuts, this place has a cult following. But if you don’t fancy an Oreo, you can take your pick of a whole host of chocolate bars to be dipped and fried in molten oil; including the infamous Mars Bar. Find them down at Camden Lock. 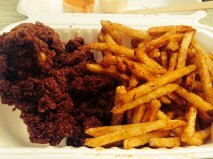 Serving tea-brined, buttermilk-soaked, twice-battered fried chicken from a converted US Army ambulance, this chicken has a hot sauce kick. Try the Cluckwitch: boneless crispy breast strips in a brioche bun, garnished with home-made hot sauce, roast pickled peppers, Iceberg lettuce and lime mayo (£7). Check the website for the latest London location and frying times. Crunchy fried pickles dipped into a smooth blue cheese dressing (£3.50) is a heavenly start to your meat feast at this Welbeck Street institution. Deep fried pickles – frickles, to those in the know – are taking London by storm. Popular in the US as a casual bar snack, they are great with a light IPA; even better as an accompaniment to the mustard-fried patty “Dead Hippie” burger. Named the world’s tastiest pastry at the Chowtzer awards 2014, this East London bakery and café is serving up deep fried jam croissants by the baker’s thousands. The deep fried croissant’s je ne sais quoi? Well, that will be the layer upon layer of fried flaky pastry, warm and fruity jam centre and dusting of crunchy sugar across the top. Sit yourself down in Shoreditch and try one with a café au lait; close your eyes and dream of Paris. A list of the top new deep fried foods in London wouldn’t be complete without a mention of the fried British favourite, fish and chips. Ok, so it’s not something new (Poppies has been trading since 1945) but this place definitely serves up Billingsgate-fresh fish with a distinctively retro twist. And where else in the capital can you pop to the chippy and soak up the atmosphere of a music gig along with your grease? Step back in time in Camden or Spitalfields.